Thanks for providing such an efficient service. I ordered the HDMI and TOSLINK cable at 3.00pm Friday, and had it working in my lounge at 9.30am Monday morning. Excellent service, price and products! Speaker Wall Plat products for the best quality AV Accessories at the lowest prices every day! 1 Speaker Hi-Fi Wall Plate (1 Red & 1 Black Terminal) + FREE SHIPPING! 2 Speaker Hi-Fi Wall Plate (2 Red & 2 Black Terminals) + FREE SHIPPING! 3 Speaker Hi-Fi Wall Plate (3 Red & 3 Black Terminals) + FREE SHIPPING! 4 Speaker Hi-Fi Wall Plate (4 Red & 4 Black Terminals) + FREE SHIPPING! 7.1 Channel Surround Sound Speaker Wall Plate (Double-Gang) + FREE SHIPPING! 4 x Speaker Wall Plate Pack + FREE SHIPPING! Amped Classic Single Speaker (White Wall Plate) + FREE SHIPPING! Amped Classic Single Speaker Architrave (White Wall Plate) + FREE SHIPPING! Amped Classic 2 Speaker (White Wall Plate) + FREE SHIPPING! Amped Classic 5.1 Surround Sound Speaker (White Wall Plate) + FREE SHIPPING! Amped Slimline Single Speaker (Brushed Aluminium Plate) + FREE SHIPPING! 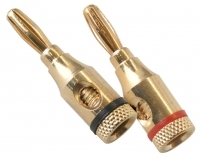 High-End Speaker Pin Terminals (Set of 2) + FREE SHIPPING! Wall Plate Mounting Bracket (5 Pack) + FREE SHIPPING! Compact Gold Plated Banana Plugs (Set of 2) + FREE SHIPPING! 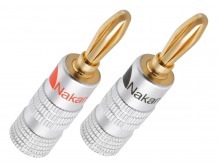 Gold Plated High-End Speaker Spade Plugs (Set of 2) + FREE SHIPPING! 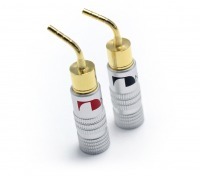 High-End Gold Plated Banana Plugs (Set of 2) + FREE SHIPPING! Most Popular Speaker Wall Plates! In-Stock & Ready to Ship! 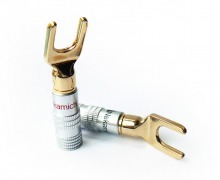 Did you know Cable Chick also stock a range of Wireless Products & AV Senders?